Home » Angelica Panganiban , Bea Alonzo , It takes a Man and a Woman , John Lloyd Cruz , news , Sarah Geronimo , The Buzz , Videos » John Lloyd Cruz became emotional while being interviewed on "The Buzz"
John Lloyd Cruz became emotional while being interviewed on "The Buzz"
John Lloyd Cruz can’t control his emotions when he was interviewed on “The Buzz” yesterday to promote his upcoming movie with Sarah Geronimo “It Takes A Man and a Woman”. The said movie is the third installment of their first movie “A very special love (2008) and succeeded with “You changed my life” in 2009. When he was asked of why he became emotional, the actor replied. “Mari-realize mong,‘wow, may ginawa ka palang (tama).’ Ganun pala. Iba pala ‘yung… minsan kasi iba ang tingin mo sa sarili mo, tapos sa ibang tao palaokay ka naman pala. Ang galing, ang galing, galing. It makes you appreciate yourself a lot better.” He said. John Lloyd continued and said, in showbiz there are times that it could change everything in you, “It can make you a not so better person. ‘Yun ang challenge, eh,” said John Lloyd. Looking back, the actor said that he is not supposed to do the movie “A very Special love” with Sarah before. “I was supposed to do a movie with another leading lady and then hindi pwede, so sabi nila ito na lang… gawin natin ito.” He shared. He was admired by all of his leading ladies in all movies that he made like Bea Alonzo, Angel Locsin, Toni Gonzaga, and Sarah Geronimo for being a talented actor. However, he admitted that there is a pressure on his part as well because the way they thought of him being a brilliant actor is very hard to handle. “Ang dami dyan na tunay na mahuhusay at tunay na dedicated at talagang magaling. Minsan nga (o) madalas nahihiya ako kapag nakakasama ko ‘yung talagang mga tinitingala sa larangan ng pag-arte na para sa ‘yo, sa standards mo, ‘yung talagang magaling. Pero minsan syempre kapag ‘yung ibang tao ang nagsasabi (na mahusay ka), alangan naman sabihin mo, ‘Naku, hindi po, wag n’yo akong bolahin.’ Magpapasalamat ka na lang. It inspires me na next time I’ll do better para maabot ko ‘yung sa tingin ko ay nararapat.” Pressed Lloydie. The actor discloses that their third installment movie of Sarah is their last movie to work together but his only wish is for it not to end, Wag, wag, wag.” That’s all what he said. When asked why he likes Sarah as his leading lady, he answered, “Si Sarah talaga since day one, since that Maalaala Mo Kaya episode, since then hanggang ngayon and naniniwala ako, we will always have this very special connection. Hindi siya chemistry. It’s a gift. Iba ‘yung sa amin ni Bea, iba ‘yung sa amin ni Angel, iba ‘yung sa amin ni Toni.” He said. Lloydie also admitted that he is not sure if his girlfriend Angelica would watch their movie with Sarah, although Angelica is a self-confessed fan of Lloydie-Sarah Love team. According to John Lloyd, on their movie of Bea “The Mistress”, Angelica did not watch it as well. He also cleared that he doesn’t have any intention yet to retire from acting. “Hindi ko sinasabing matanda na ako, I’m still very young. I really want to achieve that quality of life (when) I want to spend more quality time with my family, with my loved ones, with myself.Nagtatrabaho tayo para sa sarili natin and gusto natin ma-enjoy ‘yon. Hindi naman ibig sabihinearly retirement; three years from now, 5 years, wala na ako. 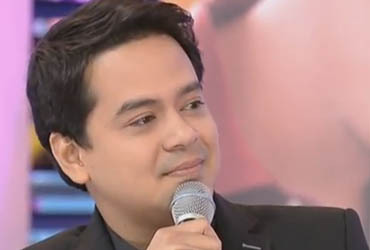 Kasama na rin dun ‘yung better choices when it comes to projects.” shares John Lloyd. Their movie of Sarah entitled “It Takes A Man And A Woman “ will be shown in theatres starting March 30 nationwide. Watch the interview of John Lloyd Cruz at "The Buzz"